Deliveries from Britain’s South Hook LNG site dropped by 88% year on year in the first half of October, amid strong demand in South Korea for Qatari gas over the period. Shippers turned to gas storage facilities to cover the shortfall in supply, leaving sites even more depleted going into the winter months. 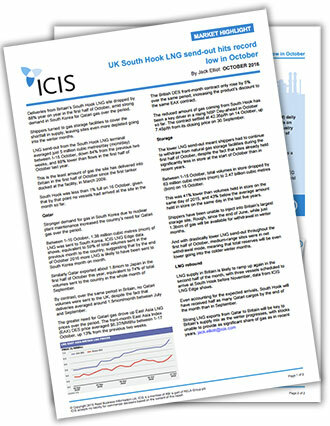 ICIS looks at why send-out from Britain’s most influential LNG terminal has fallen so sharply, in the context of an outage at Britain’s largest storage site – a time when high LNG send-out would have been a boon for the British market.